Berkshire Youth delivers a variety of first aid training sessions for young people of all ages from 8-25 years old. The training can be done in schools, youth clubs or uniformed groups and can be done as a one-off or as part of a weekly session. In the UK 120,000 people die every year in situations where First Aid could have given them a chance of survival and that's the exact reason as to why we offer a variety of First Aid courses for all ages from 8 years old and up. First Aid is unfortunately not part of the National Curriculum, but by training young people in basic First Aid we are giving them the chance to make a difference and potentially save someone's life. We will hopefully create a generation of young people who are better equipped to deal with a medical emergency and know basic first aid techniques that could potentially save someone's life. 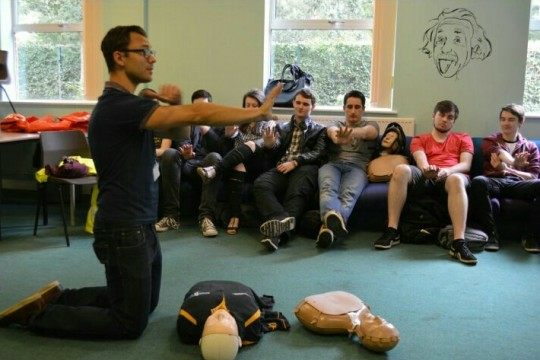 Currently, Berkshire Youth has trained over 2000 young people in first aid and the more funding we get means the more young people we can train to become potential life-savers.